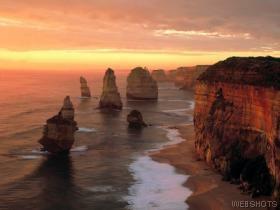 So check out of Geelong and get the bus to Lorne as that is really the next major stop along the Great Ocean Road. The bus ride was good as it went along the GOR the the views were fantasticespecially as you were that bit higher up. Arrived in Lorne around lunch time and it was quite hot, so this only makes my bags feel heavier. Found the YHA quite easily alough up a really steep hill!!! (They don't mention that in the book!) Couldn't check in until later so left my bags and went for a wonder. Lorne is a beautiful small sea side town and very popular as are most of the places long the GOR. Once checked in got changed and headed off to the beach (of course). Great beach and chilled out and read my book (this happens alot by the way!). The YHA is great at Lorne (see photos) there are seperate wooden houses adn I was in a room of 6 girls so not too bad, apart from the fact that on the first night there was a guy in the bunk above me!! Ahhh I thought it was an all femail dorm but as I learnt over the next couple of days the guy who runs it tends to let peolple sleep where ever really, although trys to keep male and female dorms seperate. But this guy in my room, turned out to be the geek from hell, so boring but he moved out the next day thank god! Next day I took the local bus back up the coast to a place called Anglesea, which has a beautiful inlet and massive beach. Spent a couple of hours there before getting the next bus down to Aireys Inlet. Here I visited Split Point Light House a fantastic place with brilliant views. Then made my way to the beach and walked along the waters edge for about a hour until I came to Fair Haven. A great suf beach and here I sat topping up the tan for a couple of hours before catching the bus back to Lorne. Again more great views of the GOR. On the way back to the hostel stopped off for cake and cappuccino, lovely. Back in the kitchen got chatting to my fellow room mates 6 Irish girls who have been travelling for months but got some good tips from them. Now the YHA at Lorne is set in some fantastic suroundings,(as you can see from the photos) is modern, clean and in bush land inhabited by lots of cockatoos, which are very pretty but also VERY noicey first thing in the morning. They feed them at the YHA and every morning they appear at the tables outside the kitchen, quite an experience really. Still at Lorne, but thats because they have a free laundry service so good time to catch up. Not a great day, weather cloudy and drizzley so walked along the rocks to the pier and back while the tide was out. Cleared up bt the afternoon so had a snooze on the beach. As it was my last night in Lorne decided to treat myself to a bottle of wine, god did it tasted good and while watching a film at the hotel I managed to drink it all (nice to know I've not lost the knack!). Off to Apollo Bay tomorrow.